Plants require roots to supply water, nutrients and oxygen for growth. The spatial distribution of roots in relation to the macropore structure of the soil in which they are growing influences how effective they are at accessing these resources. 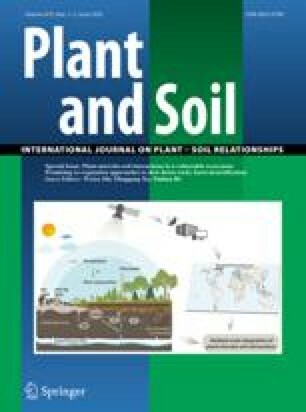 A method for quantifying root-macropore associations from horizontal soil sections is illustrated using two black vertisols from the Darling Downs, Queensland, Australia. Two-dimensional digital images were obtained of the macropore structure and root distribution for an area 55 × 55 mm at a resolution of 64 μm. The spatial distribution of roots was quantified over a range of distances using the K-function. In all specimens, roots were shown to be clustered at short distances (1–10 mm) becoming more random at longer distances. Root location in relation to macropores was estimated using the function describing the distance of each root to the nearest macropore. From this function, a summary variable, termed the macropore sheath, was defined. The macropore sheath is the distance from macropores within which 80% of roots are located. Measured root locations were compared to random simulations of root distribution to establish if there was a preferential association between roots and macropores. More roots were found in and around macropores than expected at random.